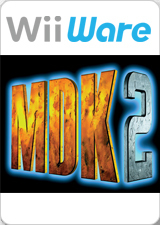 MDK2 is a video game and sequel to the third-person shooter, MDK. The original MDK was developed by Shiny Entertainment and released in 1997 by Interplay. The sequel was developed by BioWare. A remake of this game for Nintendo's WiiWare was released on May 9, 2011. The graph below charts the compatibility with MDK2 since Dolphin's 2.0 release, listing revisions only where a compatibility change occurred. This page was last edited on 15 January 2018, at 08:00.